Temple Bar is the most famous area of Dublin and you’ll find cobbled streets here with traditional pubs serving ever flowing Guinness. 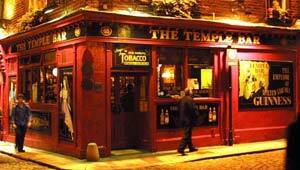 The name comes from Sir William Temple who bought the land between Dame Street and the River Liffey back in the 1600s. This area has always been busy and packed with small businesses, but over the years the businesses have changed. Predominantly now, it’s a place to find bars, restaurants, shops and galleries. If it’s traditional pubs you’re after, then take a look inside the Oliver St John Gogarty, the Purty Kitchen, the Turk’s Head and the Temple Bar. The one thing you notice straight away is the great atmosphere in Temple Bar and we really liked the Merchant’s Arch entrance opposite the lovely Ha’penny Bridge as this leads you directly to Temple Bar Square. You feel like you’re entering an area with real Irish character and charm when you come in this way. Some of the other highlights in Temple Bar include Crown Alley with attractive cafes and shops, Meeting House Square and the Irish Film Centre on Eustace Street. Temple Bar is also an area for shopping and Cow’s Lane market in particular is a worth seeing. It’s a designer and fashion street market which operates every Saturday in Temple Bar from 10am to 5pm. The range of goods available is large but typically you’ll find jewellery, clothing and accessories. A great way to experience Temple Bar is to take the Traditional Irish Music Pub Crawl which is a tour of Dublin’s best pubs led by two musicians. There are many ways to enter Temple Bar. The area is bounded by the River Liffey to the north, Dame Street to the south, Westmoreland Street to the east and Fishamble Street to the west. The Dublin Hop-on, Hop-off Bus Tour stops nearby too.